Through our global initiatives we hope to promote a greater understanding of people, places and cultures, through the education of peace, environment and global friendship. Here are a few examples of our programmes which seek to raise awareness and enhance sustainable developement throughout the HI network. At HI we believe that exploration and travel leads to a better understanding of other cultures, and in turn this creates a peaceful, smarter, and more tolerant world. As such we believe it is important to promote tolerance and peace by celebrating the UN's International Day of Peace through our Sleep for Peace Campaign. 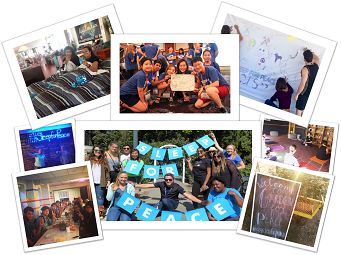 The Sleep for Peace campaign was originally established by HI USA in 2013 in recognition of the important role hostels play in promoting cultural diversity and fostering intercultural exchanges that can lead to a global dialogue. 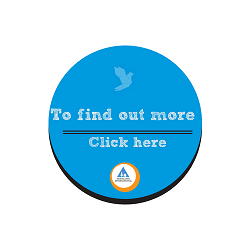 The idea was adopted by Hostelling International in 2015, it has since spread to HI hostels in over 32 countries and has gained the support of the UNWTO. HI hostels offer safe, quality environments that are ideal platforms for stimulating meaningful conversations and creating connections that can last a lifetime. 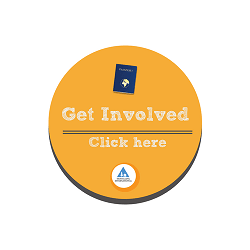 Participating hostels, host events that promote the importance of travel in encouraging tolerance through opening global conversations. To start conversations; to highlight the role of our hostels as safe places where cultures meet. To get support/endorsement from international organisations involved in peace--building, to enhance impact and dissemination of our shared values. Throughout the week, hostels in the HI network around the world will synchronise celebratory efforts, rallying around a single message, and adding their own flavour to it, reflecting the uniqueness of each location and each hostel’s role. Our initiative is supported by the UNWTO and has been growing in numbers and more importantly in significance over the years. The Hostelling International Sustainability Fund was introduced in 2013, with the aim of helping our customers offset their overnights and reduce the carbon footprint of the HI Hostels. Since 2012 we have been in partnership with myclimate with the goal of fighting climate change through calculating and compensting for CO2 emission by working with hostels and offering guests the option to mitigate their CO2 emmisions when booking overnight stays. 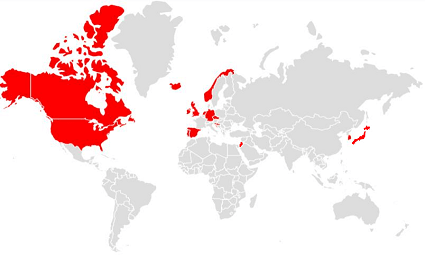 This option is currently offered in 35 countries. All contributions flow to three international myclimate UN Gold Standard Projects where we provide new jobs, contribute to local growth and increased levels of health. When choosing to offset your overnight, you also contribute 0.10 GBP per night to finance sustainable initiatives that reduce the carbon emissions of our hostels. In order to decide which great projects to support, we run a yearly competiton in which we ask you, our guests, our sustainability coordinators and an international jury to choose their favourites. Since 2013, the HISF has caught the attention of, more than, 55,000 people who have supported and voted for their favourite projects. 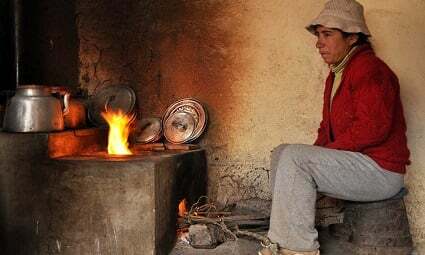 Over the last 5 years, 16 projects have been selected for their innovative contributions towards reducing C02 emissions and their work towards achieving sustainable livelihoods. 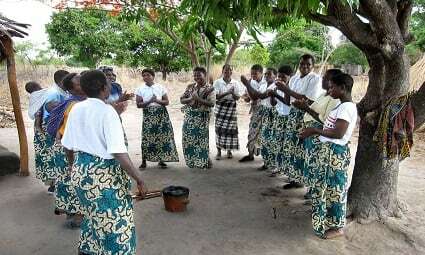 Collectively the prize fund has totalled £148,252, received from over 238,000 unique donations, all of which has gone directly into funding each of these 16 inspiring projects. Through these projects the hostels have not only reduced their CO2 usage by close to 600 tonnes per annum but they have shown great commitment to the HI Sustainability Strategy, the SDGs and proven themselves as inspirational role models within the HI network. We are positive these projects serve as a spring board for ideas, generating a trickle-down effect, encouraging continuous improvement for others and engaging our guests. Auberge de jenesse dela clusaz won the top prize of 2017 for its proposal; Food with a conscience- vegetable garden at altitude. 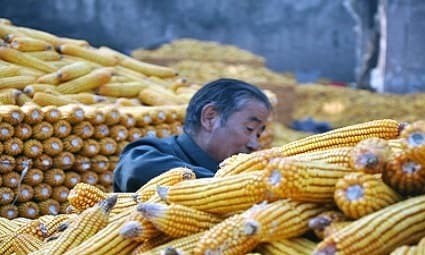 The primary objective of this project was to highlight the impact of diet in terms of resources protection, pollution, greenhouse gas emissions, animal conditions, however it also emphasised the importance of homemade produce. 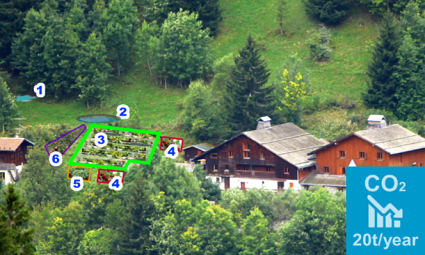 La Clusaz Youth Hostel also intended to extend and stress its approach to 100% organic, local or fairtrade food with the creation of a vegetable garden at altitude in permaculture. With the aspiration of becoming the first French Youth Hostel offering a diet in favour of vegetarianism, 100% organic, local, fair trade or from the vegetable garden at high altitude in permaculture. HI New York City were awarded a prize fund of £6,000 to help achieve their goal of zero waste through contributing towards the installation of an in‐vessel composter that turns organic waste, like food scraps, into nutrient‐rich compost in 24 hours! HI New York City is the largest hostel in the USA. 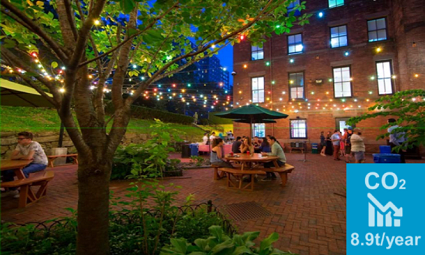 Each year, the hostel welcomes 75,000 travellers and community members and hosts over 1,000 community events, gatherings, and educational programs. The hostel currently recycles 25% of its waste, but this piece of equipment alone will help to achieve up to 50%. With better communication and equipment as part of this project, our recycling rate will increase as well. The goal; a 75% diversion rate (recycling plus composting) by 2020. 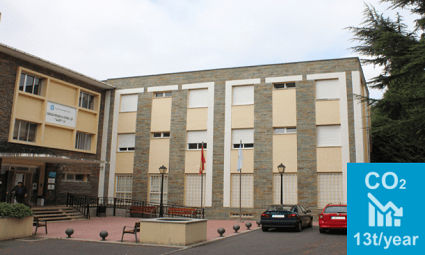 Located in the Residential Lug complex, Albergue Lug2 is located just 5 minutes from the centre of Lugo and within walking distance of the Biosphere Reserve Terras do Miño. This unique setting of bordering the city while immersed in nature gives the hostel the advantage of being able to engage a wide audience of both locals and visitors to the region. Albergue Lug 2 was awarded £3,800 to contribute towards its projects which aimed to reduce CO2 emissions by using LED lighting, implementattion of campaigns to educate the city on sustainable hostelling, promote sustainability through Non-Regulated Housing Education programs, the inclusion of a sustainable ethos through the hostel’s entrepreneurial spaces and creation of sustainable tourism packages. 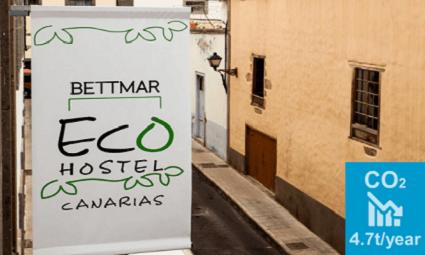 Set in the typical Canarian style house of the 19th Century, Bettmar Eco-hostel, Las Palmas, Canarias, Spain has been completely renovated using recycled materials. Ecology is an important issue for Bettmar Ecohostel, and they emphasise this by providing information and tips to care for our planet. Winning the top prize of £10,000 in 2016 for their energy conservation project, the hostel proposed the installation of translucent solar panels on the roof covering the central patio of the establishment. A guest awareness campaign to highlight the importance of natural resources in reducing the carbon footprint and promotion of the use of environmentally friendly vehicles were also significant objectives of this project. 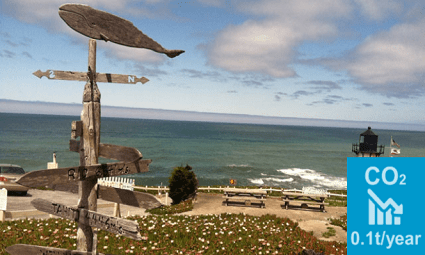 HI Point Montara Lighthouse benefits from breath-taking scenery and surroundings that are enjoyed by tens of thousands of guests and community members each year. Climate Change and anthropogenic activity pose a significant threat to the area with prolonged and extreme droughts increasingly becoming an issue. This project decided to make a difference by recycling waste water aka gray water for use in irrigating the gardens and surround landscape where needed. The result ended in the design of a sustainable garden to create an ecosystem at the hostel that benefits the local environment, staff, and visitors highlighting the benefits of, and need for water recycling and sustainable landscaping. 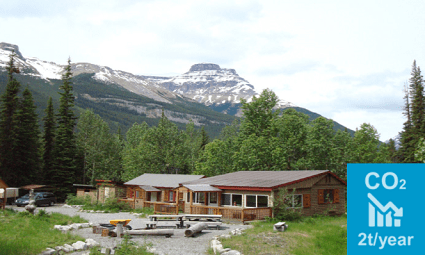 HI Rampart Creek, provides guests with a stunningly beautiful setting, challenging hiking trails, a warm stop-over on a cycling trip or an excellent base for ice or rock climbing. Already harnessing the power of renewable energies the hostel received £2,028, for their innovative and practical design proposal for hybrid refrigerators. Displaying an exceptional example of simplicity and ingenuity in harvesting elements from our natural surroundings without causing harm to the environment. The proposed hybrid refrigerators provide an innovative and inspiring example of using existing technology to reduce this hostel’s reliance on propane fuel in its operations. 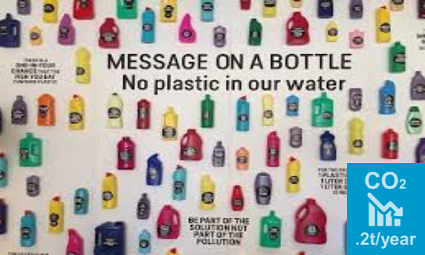 Stayokay, was granted £1,466.92 for its project Message on a bottle, No plastic waste in our water. Water is a treasured resource in the Netherlands and is what inspired this project aimed at activating people’s attitudes and behaviours towards reducing water pollution. Water in the Netherlands is amongst the safest and cleanest drinking waters in the world. Single-use plastic bottles are not necessary, and are directly responsible huge and unnecessary waste. By selling durable bottles and providing drinking taps for guests this projects goal was to reduce plastic waste in our waters. Worldwide, only 1% of plastic is recycled and 50% of plastic is thrown away directly after use. Did you know it requires 1 litre of water and 1 litre of oil to produce a single plastic bottle? Runners up: FUAJ, France; HI Masada, Israel; Gjøvik Hostel, Norway; Ullapool Youth Hostel, Scotland; Youth Hostel Tresor, Slovenia; STF Grövelsjön mountain station, Sweden. Runners up: YHA Hadrian`s Wall, The Sill, England & Wales; Belle Ile Youth Hostel ,France; Beit Shean Youth Hostel, Israel; Norway; Albergue Juvenile Espinosa de los Monteros, Spain; HI USA. Runners up: Grampians Eco YHA, Australia; Youth Hostel Sucre, YH El Villar and YH La Paz, Bolivia; Shining hostels, Brazil; HI Kananaskis, Canada; Heart 2 Heart Youth Hostel, China; Reykjavík Downtown Hostel, Loft Hostel and Reykjavík City Hostel, Iceland; Youth Hostel Ein-Gedi, Israel; Youth Hostel Nuovo Ostello di Bergamo, YH Mergellina Naples and YH Villa Camerata Florence, Italy; Stayokay, Netherlands; YHA Rotorua, New Zealand; HI Slovenia, Slovenia; Davos Youth Hostel, Switzerland. Flexible framework: the possibility to choose participants in line with your mission and vision; involve receptionists, housekeepers, office staff, volunteers, external participants, etc. Some take part in HI-Connect to develop language skills, cultural awareness and open-mindedness, others to learn from best practices in other workplace, some to put themselves outside of their comfort zone and push further their boundaries.